It is our ambition to always cook at an excellent level and prepare unique culinary experiences for all our guests. 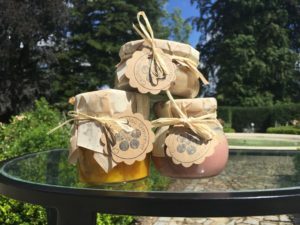 With the Chateau Heralec Gourmet Line, we offer you the option of enjoying the smells and tastes of good local food at home as well. High-quality local products, that form the basis of our kitchen, are prepared in wonderful packages at the reception – cheese and yogurts from our local farm in Úhořilka, chocolate pralines from a local chocolate factory in Vyskytná, delicious dried fruits from Trebic. During the Christmas season, we work on preparing dried mushrooms from the local Vysocina forests. We are constantly updating and perfecting our gourmet line offer so please do not hesitate to ask for more information at the Chateau Heralec reception upon your arrival.